A year ago I joined my very first mystery quilt. It was Bonnie Hunter's En Provence quilt and it ended up being my 76th quilt, A Team En Provence. This week I started my second Bonnie Hunter mystery quilt. Here's a look at my week 1 clue. I'm changing up the color scheme a little bit, but I'm loving the aqua and gray. Ah! Thanks. My picture is showing now. Love your finished 'en Provence', wonderful colour combo! Love Bonnie Hunter! This will be fun to watch coming together. Thanks for linking up to Wednesday Wait Loss. Your en Provence looks great. I've been enjoying seeing everyone's Ringo Lake pieces - I like your colors. 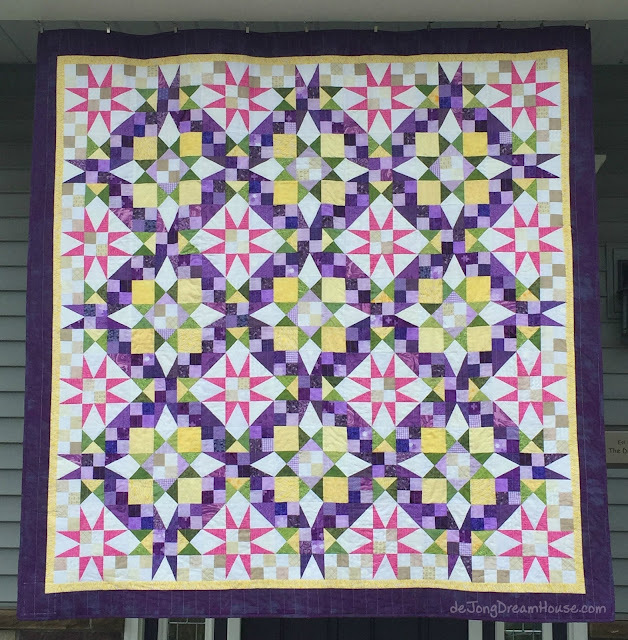 Love the colors you've chosen for both quilts - well done! Your blue and grey are lovely--very calm and quiet. Your en Provence is beautiful. Good start on this year's mystery too! Did you know your link to "Design Wall Mondays" is showing "http://%20em%27s%20scrap%20bag/" when I click on the link. It's that way on all three of the Design Wall Monday links for the Monday December 4th linkup to http://smallquiltsanddollquilts.blogspot.com Thanks for making an appropriate correction. I can't fix it from here. I love your color combo!